Mrs. Kelli Bainbridge I am so honored to be the principal of this amazing school! Education has been my life for more than 30 years. My first teaching position was in California, where I taught kindergarten and first grade in Diamond Bar. After moving to Colorado, I taught first grade in Aurora for two years. I have been in the Douglas County School District for the past 20 years. In that time, I taught kindergarten, second and third grades, then took a position as a staff developer and the International Baccalaureate Coordinator at Rock Ridge Elementary School. I have been the Principal at Pioneer for six years. I am a graduate of Pepperdine University in Malibu California (Go Waves! ), where I majored in Sports Medicine. After graduation, I attended California State University to study Elementary Education and earn my Teaching Credential. My husband, Dwight and I have been married for more than 30 years and have two grown daughters. 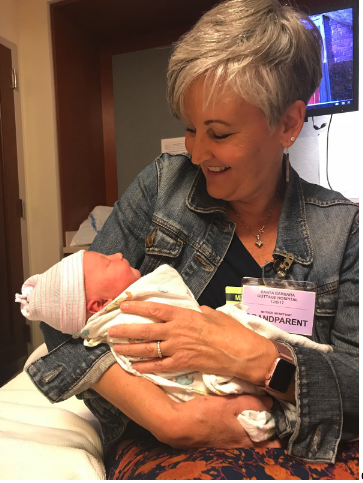 My oldest daughter recently blessed us with our first grandchild, Rosemary, who was born in December of 2017. In my free time, I love the arts, especially the theater. My husband and I enjoy traveling and camping. I also enjoy crafting, especially sewing, knitting and needlepoint.